Continuing from my previous post on this series. · Read authorization allows reading, but not modification of data. · Insert authorization allows insertion of new data, but not modification of existing data. · Index authorization allows the creation and deletion of indices. · Drop authorization allows the deletion of relations. The ultimate form of authority is that given to the database administrator. The database administrator may authorize new users. A view can hide data that a user does not need to see. Views play a very important role in providing data security, and it simplifies the complex queries so that users concentrate only on required portion of the relations (tables). It prevents users from direct access to a relation; they can only view portions of the table. Here clerks are not authorized to see salary information directly from employee relation. But he must be granted access to the view V_emp. It provides a security on relation emp. A view V_emp must have read authorization on employee. A user who has been granted some form of authorization may be allowed to pass all or part of his/her rights to another user. Consider an example, the granting of update authorization on the loan relation of the bank database. Assume that, initially, the database administrator grants update authorization on loan to users U1, U2, and U3, who may in turn pass on this authorization to other users. The passing of authorization form one user to another can be represented by an authorization graph. The nodes of this graph are the users. 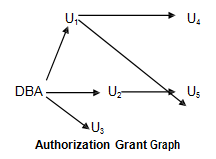 An edge U1 Uj is included in graph, if Ui grants update authorization to Uj. The root of the graph is the database administrator. Observe that user U5 is granted authorization by both U1 and U2; U4 is granted authorization by only U1. A user has an authorization if and only if there is a path from the root of the authorization graph down to the node representing the user. Suppose that the database administrator decides to revoke or cancel the authorization of a user U1, but U4 and U5 have been granted authorization from U1. Before revoking authorization from U4, U1 has to be revoked. But there is no need to revoke permissions from U5 because U5 was granted permissions from U1 and U2. Both U1 and U2 are still granting authorization to U5 who retains update authorization on loan. To properly revoke access rights, all paths in the authorization group must start from the authorizer. The SQL data definition language includes commands to grant and revoke privileges. The SQL standard includes delete, insert, and update privilege. The select privilege corresponds to the read privilege. The privilege list allows the granting of several privileges in one command. The following grant statement grants users U1, U2 and U3 select authorization on the branch relation. Grant select on branch to U1, U2, U3. The update, insert authorization may be given either on all attributes of the relation or on only some. Grant update (amount) on loan to U1, U2, and U3. If we wish to grant a privilege and to allow the recipient to pass the privilege on to other users, we append the with grant option clause to the appropriate grant command. Grant select on branch to U1 with grant option. Cryptography has been practiced to provide sufficient protection for highly sensitive data. It is not possible for encrypted data to be read unless the reader knows how to decrypt it. In a distributed environment, translating highly confidential information between remote sites, which is with the increasing use of public communication facility to transmit data, it is most important to secure data. Otherwise it leads to leakage. There is a vast number of techniques for the encryption of data. Consider an e.g. : Substitution of each character with the next character in the alphabet this. A good encryption technique should be relatively simple. It should be difficult to determine the encryption key for an unauthorized person. An encryption technique developed by the US National Bureau of Standard (NBS) is called data encryption standard (DES), does both a substitution of characters and a rearrangement of their order on the basis of an encryption key. We must keep the encryption key secret. However, the drawback in this key scheme is that the encryption key has to be transmitted to the recipient before a message can be transmitted. Public key encryption is an alternative scheme that avoids some of the problems that we face with the DES. Public key and private key: This allows anyone to send a message in a coded form. However, decryption key is secret and only the rightful recipient can decode the message. It is more secure and it is expensive. BI SQL # 268 : SQL Server DBA Scripts : Find Statistics Info for all tables BI SQL # 267 : SQL Server DBA Scripts : Identity Columns: Are You Nearing The Limits?